I typically don’t like to toot my own horn but…TOOT TOOT! 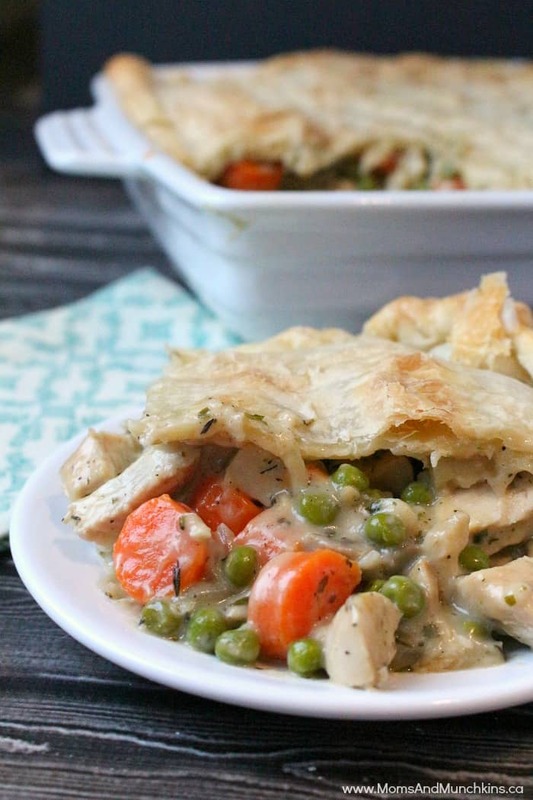 This is seriously the best Chicken Pot Pie recipe! I’ve made this recipe several times over the last couple of months and it’s a hit with my family every time. I use the same Tenderflake Rolled Puff Pastry Sheets for the crust as I used in this Chicken Broccoli Cheddar Bake. The pastry sheets are easy to work with and taste better than anything I could make from scratch. I bake this in a 9″ x 9″ baking dish. It’s the perfect size for the Tenderflake Rolled Puff Pastry Sheets and there is enough filling for a full casserole without it overflowing. I bake this in a 9" x 9" baking dish. 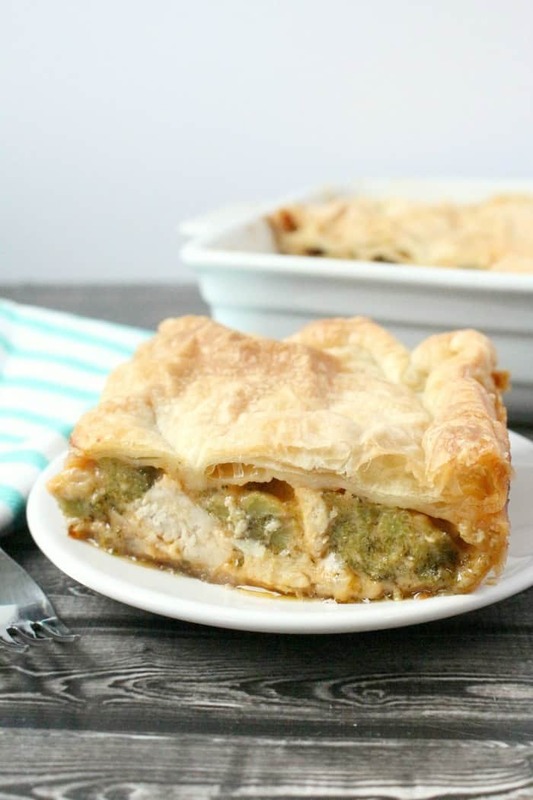 It's the perfect size for the rolled puff pastry sheets and it has enough filling for the casserole without it overflowing. Remove both Tenderflake Rolled Puff Pastry Sheets from box and allow to thaw in their packaging at room temperature for 2 hours. Alternately, they could thaw in the refrigerator overnight. In a lightly greased 9" x 9" baking dish, place one thawed pastry sheet (poke a few holes in it with a fork before baking). Bake for 15 minutes. Remove from oven and set aside. In a large frying pan, melt the butter over medium-high heat. Add carrots and onions to the frying pan. Cook until onions are slightly brown. Add mushrooms, garlic and celery. Cook for about 3 minutes before the next step. Add cooked chicken, chicken broth and heavy cream. Stir well to mix and reduce heat to medium-low. Add flour and stir well to mix. Add thyme, parsley, pepper, salt and frozen peas. Stir well to mix. Simmer over medium-low heat for 5 minutes until sauce starts to thicken. Pour mixture into the baking dish over the cooked pastry sheet. Add the second (uncooked) pastry sheet over top of the mixture. 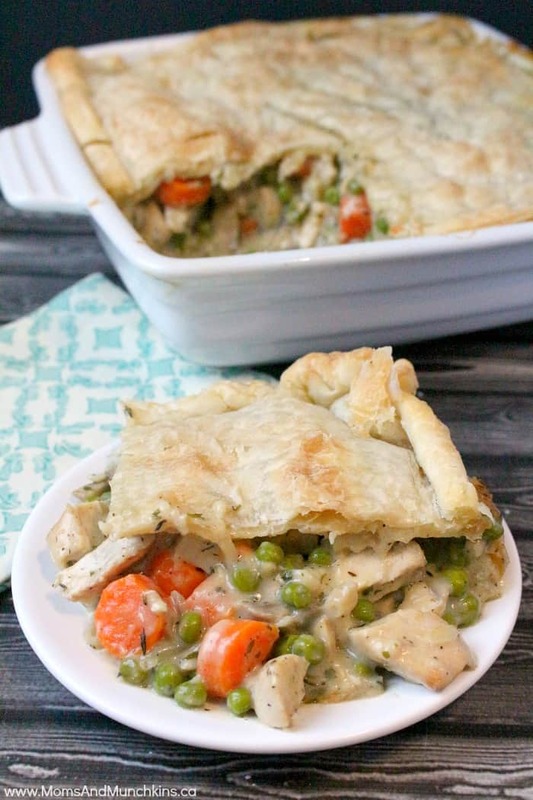 Pinch sides of uncooked pastry sheet to the cooked one to seal the pot pie. 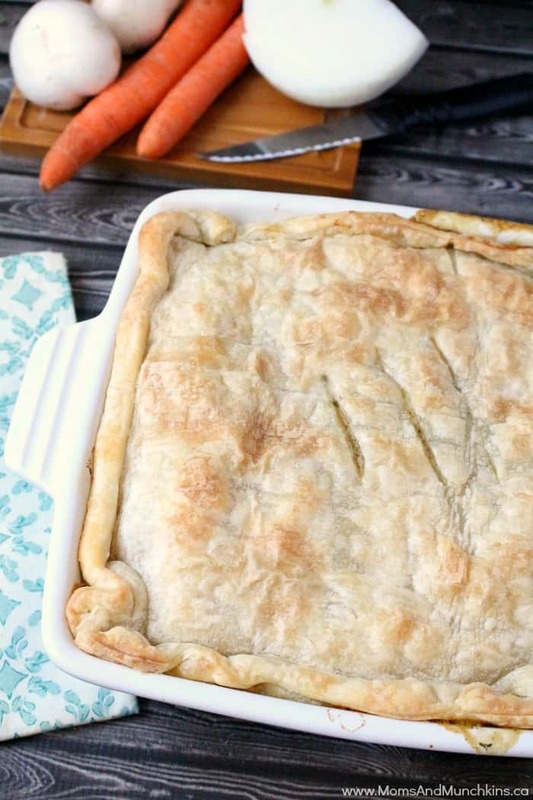 Use a knife to cut about 3 diagonal lines in the top of the pot pie before baking. If the filling looks like it could overflow while baking, place your baking dish on top of a cookie sheet to prevent spills inside the oven. Place in oven (375F) and bake for 25-30 minutes (until pastry sheet is browned). 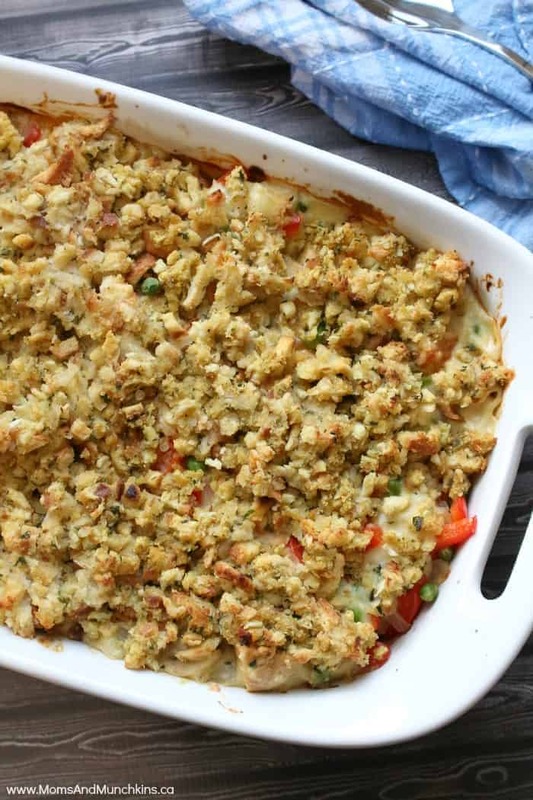 For another delicious family meal idea using the Tenderflake Rolled Puff Pastry Sheets, check out this Chicken Broccoli Cheddar Bake. 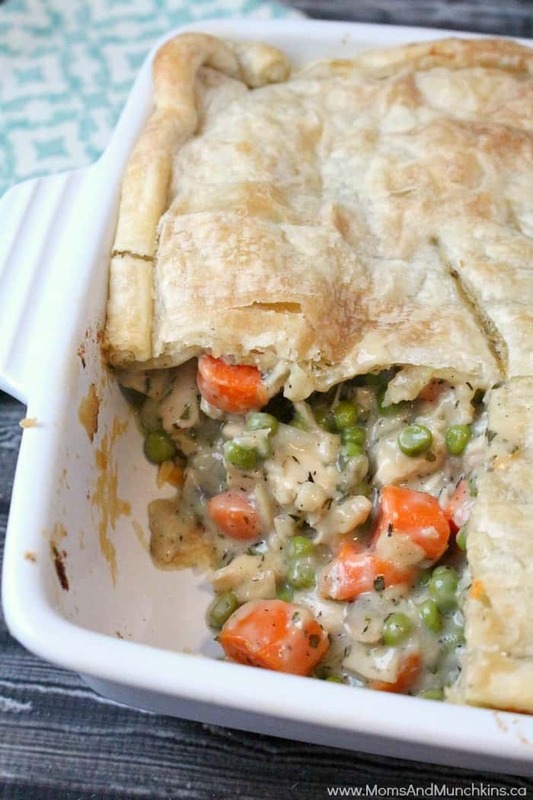 For something totally different, check out this Chicken Pot Pie recipe with a stuffing crust. For more delicious recipes including party appetizers, family meals and irresistible desserts, visit our Recipes page. Never miss an update by following us on Facebook, Twitter, Pinterest and Instagram.